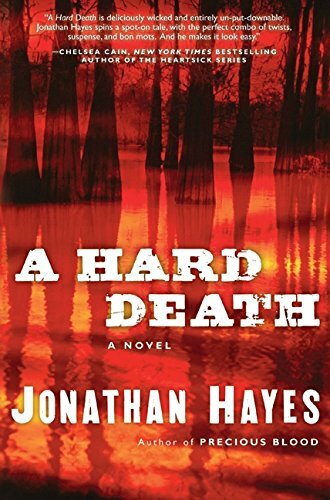 A Hard Death by Jonathan Hayes was a book unlike than those I normally review—an utterly different experience from science and health-related nonfiction; nonetheless, this mystery novel draws together the suspense and thrill-driven plot of a visiting medical examiner with forensic details that are at once so integral to the plot and so satisfyingly grisly you may even want to sneak back and reread them. In A Hard Death, Dr. Edward Jenner, the main character also found in Mr. Hayes’ first novel Precious Blood, takes a temporary position as a forensic pathologist in his former mentor’s district of Douglas County, Florida. Author Hayes, a forensic pathologist who also spent some time as a medical examiner in South Florida, deftly creates an atmosphere of intrigue and humid swampland that convinces the reader that they are with Dr. Jenner in the resort town of Port Fontaine. While investigating a series of murders, Dr. Jenner meets characters who are both three-dimensional and convincingly human and often sinister. In many cases, the reader will be kept guessing as to each character’s motives and actions. A Hard Death, which is written in short, suspenseful chapters, will have the reader galloping toward the book’s end, hanging on for dear life through exciting twists and turns until the very last pages. Mr. Hayes has woven an exciting web of forensic science, plot turns, suspicious people, and southern Florida—which together coalesce into a thrilling mystery novel that creates an atmosphere not easily forgotten.